Wrongly un-convicted killer O.J. Simpson was granted parole today for a robbery that put him behind bars in Nevada for 9 years. 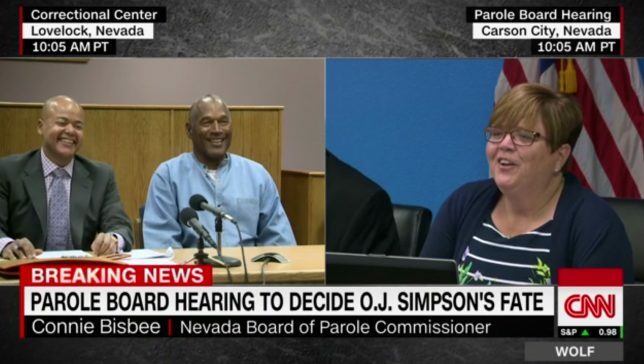 Appearing before the Nevada Parole Board of Commissioners, O.J. had a good time, sharing jokes with board members and laughing. He joshed that Nevada officials would be glad to see him leave the state, and others in the room laughed with him. Parole board chairman Connie Bisbee not only flirted and joked with Simpson: she brought trays of cookies, as if hosting a party instead of conducting state business regarding the incarceration of a brutal two-time killer. Meanwhile, Simpson’s daughter Arnelle complained that she and her father were the real victims of the justice system and that their suffering at his incarceration was unbearable. “No one really knows how much we have been through, this ordeal the last nine years,” Arnelle Simpson said, preening for the cameras. O.J. even used the occasion of his parole hearing to mock the families of Nicole Brown Simpson and Ron Goldman. “I’m in no danger to pull a gun on anybody. I’ve never been accused of it … Nobody has ever accused me of pulling any weapon on them,” he sneered. The parole board laughed as he said those words. He stuck the knife into his victims’ families once again, and then the parole board laughed, and then they let him go. Why did the parole board help Simpson make a mockery of the people he killed? Why did they laugh with a killer who escaped justice? When Arnelle Simpson announced, gawkingly, that “we recognize O.J. is not a perfect man … But he has done his best,” nobody even challenged her. 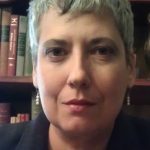 She spat in the faces of the parents of Ron Goldman and Nicole Brown Simpson, but nobody on that parole board bothered to object, not to the desecration of Simpson’s victims, and not to the ways Simpson made a mockery of the parole process, where he was supposed to express remorse and demonstrate humility. O.J. Simpson murdered two people in cold blood. Then he used his skin color to incite the racist mob in the jury box, and the racist mob let him go free. By wrongfully acquitting him, the racist mob in the jury box transformed his private murders into a public lynching for the world to see. And across the country, in office cubicles and public transit and faculty lounges, countless blacks cheered the lynching of Nicole Brown Simpson and Ron Goldman. Egged on by Simpson’s defense team, they cheered the murders because the victims were white, and no white person dared to object to the blood-drenched, racist hatred being spewed at them by their co-workers. When O.J. Simpson was acquitted, I was working with a feminist nonprofit where the black women ran around the halls high-fiving each other and cheering. The white women stood silently, knowing they dared not react to the racist, hate-filled abuse being heaped on them. The aftermath of O.J. Simpson’s acquittal for the murders of Nicole Brown Simpson and Ron Goldman had the hallmarks of a classic lynching: there were spontaneous public celebrations in the streets; souvenirs were sold, and musicians wrote songs commemorating it. Like President Woodrow Wilson (D), who screened the racist film Birth of a Nation in the White House, Barack Obama (D) hosted several rappers at the White House who had written equally racist songs celebrating the lynching of Mrs. Simpson and Goldman. Such normalization – even tacit celebration – of the lynching of whites by blacks at the highest level of government changes the meaning of the entire 100-year crusade against lynching itself. Is lynching wrong? Not if it is done to whites, according to O.J. Simpson. And also according to Barack Obama.